This entry was posted in Crazy Little Thing Called Life and tagged American Sign Language, ASL, Deaf Children, deaf education, Leah Coleman, rachel coleman by Rachel Coleman. Bookmark the permalink. Love your blog on this issue! Ironically, my wife and I are hard of hearing and deaf with two hearing girls. I even get the word that my eldest daughter that she should stop signing while in the school. I said NO! Let her be… She’s billingual and developing into a good student with a knowledge of two worlds. I am behind ya all the way! Wow, we had such a similar experience with our deaf son in the mid 80s in northern Wisconsin. Such incredibly low expectations for our very visual, bright young son. And such few options available and very few deaf adult role models 🙁 . Luckily after attending a national conference on “Unlocking the Curriculum” we came to the same conclusion that you did and uprooted our family and moved to Indiana for our son to attend the Indiana School for the Deaf. Best decision we made, he is now a successful young adult you has his masters and is currently working at the Smithsonian American History museum in a professional role. Sure wish we could spread the word to more hearing parents of deaf children! I know I will be quoting your story as well when I am asked how to raise a successful deaf child! Thanks for sharing your story! Pingback: broken education | What's that you said? I am sorry I did not find your blog earlier. I teach in an Interpreter Preparation Program and many students this year have mentioned wanting to become teachers of the deaf. I hope you don’t mind if I make your article required reading for them. I always tell them how many parents are faced with the difficult educational methods and decisions, only to be told later they “failed” if their child did not flourish and/or learn to speak. How sad that no one has fixed the broken system in 100 years!! I’m a hearing, lifelong ASL lover who is a huge fan of your Signing Time series (my kids are huge fans, too!). I just stumbled across your blog today after my curiosity was piqued because of your FB post about having a long lost daughter! I am an adoptee, and I can tell you that there is no greater gift than having a birthmother who is selfless and courageous enough to sacrifice her own needs for her child. For you to be able to do that so young is incredible! I am in tears reading through your posts here on your blog. Happy, sad, and triumphant tears! You are so inspirational! Every woman should know she has the power to be as strong and resourceful as you have proven yourself to be. One of my twins has Down syndrome. He just turned two and already uses 11 signs! One of them he learned from his brother, who knows over 50 thanks to your videos! We have the same problem in Tennessee with ASL instruction. The public preschool teacher won’t allow signs. She makes kiddies hand her picture cards. I’m not going to carry stacks of pictures around with me just so my child can communicate with me at the grocery store! One of my friend’s daughter was under this woman’s tutelage as a speech therapist. The little girl signed a three word sentence (More cracker please)and the teacher refused to give her a cracker until she handed her the picture with the cracker on it. My friend was in the observation room and barged in on the session, demanding her three-year-old child be rewarded for her efforts. From what I have read and now experienced, children who sign have a 30% higher vocabulary than children who don’t. I believe it! My typical child shocks us everyday with the new words he signs and speaks! Whenever I catch myself whining about all the therapies and all the things in my life that have to change because of Down syndrome, I just remember your blog about being strong enough, and I pray for the courage and strength to believe that I am strong enough to be his mom! Hi Rachel, Your family has been a part of ours since my son, then 5 mos. old, got his first hearing aids. We have all your DVDS! This is my first visit to your blog(where have I been?!) and I found it through a Deaf advocacy website. My son also has Down syndrome so his situation is extra compicated. We found out at his IEP yesterday that they feel he doesn’t belong in the SDC for DHH (where they use Total Communication) anymore because he needs to be in a Functional Skills class (I hate that term) where there is an aide who has only had 3 semesters of ASL. We tried to impress upon them that since David’s speech is so severely delayed we want to be sure he has a language. ASL is his first language and as his 9 year old sister says, “Sign language is how he lives his life!” After reading your entry, I am inspired to find out how we can create the best educational setting for our son and not settle for what the broken system has to offer. Just because David has Ds, that shouldn’t exclude him from receiving the services that his DHH peers are entitled to!!! I’m not sure where the best place is to leave this for you and Leah to check out… but I came across this Party in the USA video tonight and instantly thought of Leah. 🙂 I la,la,love reading your story and blog. Thanks for being so open and sharing your testimony. It’s so inspiring to see you truly living out your faith and making the most of your life! God has blessed you and your girls so much! enjoy the ASL version of Party in the USA! I am an example as a Deaf role model. You can do anything you want to do in life. But it all bases on the education you get for your child. I agree any child could learn from ASL. It depends on who teaching it and how. There’s teachers out there that are signing some English within the ASL, which is totally wrong. Stick to the game plan and she will rise to what ever she wants to be in this world! This post moved me to tears. It should have come with a warning to go get the kleenex! I was a “professional” (interpreter/SKI-HI/infant signing instructor) that happened to have progressive hearing loss before I became the mother of a child born with hearing loss and a cleft lip/palate. 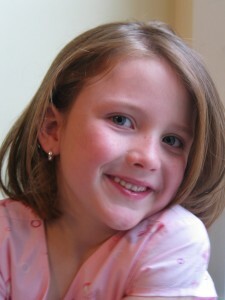 Later, two more of my girls developed hearing loss as they got older. My second grader just got her FM and hearing aids. One of my favorite “Signing Time” moments was when you sang and signed “Happy Birthday” to my littlest one as the last in line at a meet and greet in Muncie, IN. What a great first birthday for her! We will continue to buck the system because, as you say, it IS broken and what passes as acceptable certainly is NOT. I love the inspiration you bring with your honesty and spunky attitude. It helps to know I’m not the only one who has fought the good fight only to go home and cry in my pillow about why it is soooo stinking difficult to get professional educators to understand what we KNOW is the right path for our kids. Anyway…all this to say thanks for this post! Every time I need to recharge that battery…I’m rereading this! Sorry if I sound much like the last post, but I am also close to tears reading this. And, also want to include a shameless plug for the Indiana School for the Deaf (ISD). I have frequently asked the EXACT same things that I read in your blog and am disheartened that with so much support, the media ignores our requests, yet shows coverage on a deaf child receiving cochlear implants as some miracle instead of embracing the 3 year old with well above average language acquisition because that language is signed. I am tired of being told that my deaf son will be different and not assimilated into society because he is different. I am just tired! Any insight on how you do it and resources you have used would be so appreciated. A deaf friend of mine forwarded your blog to me. I am a Pre-K educator and I work with students with developmental delays and English language learners but I have not yet had the opportunity to have a deaf student in my classroom. Kudos to you and your husband for not taking “no” for an answer. I grew up in school with deaf students mainstreamed in classes with typical peers. One of our classes as speaking students was ASL. I can STILL remember being in that classroom, practicing signs, conversations and presentations of the songs we learned, “Kokomo- by the beach boys” :-). Oh, how found my memories are of having that experience enrich my life! I don’t understand why the school district is not treating ASL as a language. It is another language! It’s so simple it’s STUPID to interpret it any other way! I have had this exact conversation so many times with people. My son will be 5 next week and he is Deaf, he is in an all ASL school, but we are stuck in Utah and the system here could not be more horrific for parents of Deaf kids. I get so annoyed when people say to me “oh he is Deaf, can he read my lips” “No” I say “he has never heard English, he is Deaf, first he has to learn ASL, then written English, then maybe he will learn some lip reading” People are always so surprised at first then they think about it, then they get it. I am frustrated to tears with the broken system here. We know we are going to have to move so we can give Ira everything he needs. What do you think? What state would you say has the best program? A friend of mine shared this link on facebook and I am really glad I clicked on that link and read the whole thing. Your story was very engaging and it touched me in so many way. I am profoundly deaf and have hearing parentswith whom I’ve been fortunate enough to be able to communicate through ASL. They didn’t know any ASL at the beginning either. I have to credit them for not putting any limit on me and keep instilling the idea that I can do “anything” that I ever want to do with my life. I am proud to say that I have graduated with bachelor degree from Rochester Institute of Technology and am now working in the technical support department for the big corporation. I know plenty of my deaf friends who are as successful with their lives. I know two friends who started non-profit organizations, with one responsible for finding more deaf people around the world and another for setting up a deaf network around the world. I also know two deaf friends who work for Google and they both love it there. I know one deaf friend working for Intel. Another at Yahoo. And plenty of them working for federal agencies. There’s really no limit to what we can do and accomplish. A hearing parent with attitude like yours, there is no doubt that Leah can and will accomplish many things in her life as well. It is because you refuse to put any limit on her. I commend you for that. Bad logic much? There is nothing *unhealthy* about skin color. You’re missing Rachel’s point! I believe what she meant was you can pick any “difference” single out any characteristic and people would be outraged….but because this is the state of things for deaf children, it is merely accepted as okay and “normal” even! Also, who ever said there’s anything “unhealthy” about being deaf? Renee, I agree with you. Apparently there are two Joshs here. The first one is mine, but I don’t know the 2nd one because that one is not mine. Apparently someone else logged in with the same name. Just FYI. Thanks, TheOtherJosh, for clearing that up! So many people with the same names, it gets confusing! Her point was that it is wrong to say that about any one with any thing that is different about them,not that some one is black. And being deaf is a disability, not a disease. So shove off. There’s nothing unhealthy about being Deaf or Hard of Hearing either, Bubba. Equating a language difference with the word “unhealthy” is just as preposterous as me saying my relatives from Canada who only speak French are unhealthy. Are they at a loss sometimes when visiting me in Texas? Sure. Then they consult a French-English dictionary and they’re just fine. As fine as I am when sometimes I have to resort to using pen and paper in a restaurant where nobody signs. But we evolved as a society. After reading this blog, a link from another blog, (a favourite) I will say I find your story fascinating and motivating, and of course very very amazing. God has blessed you and your family with a wonderful opportunity and the rare but needed passion to beat the system and fix what is wrong, at least within yourself and your household. I am truly at a loss for words to describe how amazing your story is. Thank you for blogging your amazing experience, it is hope for all the mothers out there, beating the wrong of the system for their children. I’m glad I’ve came across “Signing Time” and this blog. My son has a moderate to severe hearing loss in both ears, but it wasn’t until June 2012 that his father and I found out for sure. I blame myself for getting help so late because he didn’t past his hearing screening at birth, but I too thought this was something that he will out grow. No one else is our family is deaf or hard of hearing. Now, since working with Early intervention and his early placement in pre-school he is using ASL and his voice. However, I’m a parent that is fed up with depending on the Public School system and listening to their negative comments about my son’s education development. I was just recently told by a special education representative that my son wouldn’t catch up to his hearing peers until he was in high school. I’m just glad that he has parents who are fighting for a completely different outcome, but hearing news like this makes you feel hopeless. Other parents are fighting to try to get extended day summer program for our deaf and hard of hearing children because we fear that over the summer break their language will regress. But, the system is trying tell us that our children don’t need it because they will always be behind. I’m a stressed out, but determine mom who will never give up on her child. Have any other parents had this problem and if so, how was it resolved? Thanks Rachel for the positive feedback, it’s very much appreciated. I’m going to continue to fight for my son’s education. I’m not happy, but I’m relieved to know that other parents of hearing impaired children are experiencing the same problems. I never realized how inconsiderated the public school system could be; however, I’m very thankful that my son has a great teacher who is very dedicated to her students hearing and speech development. I will never accept someone telling me that my son is incapable of doing anything. Anything is possible!! I’m learning, as a parent of a hearing impaired child, that I’m my child’s voice until he’s able to use his own. Great blog and great example of being parents! That’s truly what it means to make your children priority! I learned so many signs through your videos with my kids that we still use to communicate in noisy areas. We sometimes get comments from people who wonder why we’d sign if we can talk… baffles me….why does one speak Spanish at a Mexican restaurant but not at home??? Why would I prefer to yell like an idiot and have everyone know our business across a room when we can sign? For us it’s no necessity but rather a wonderful commodity that I continue try and build on. Thanks for leading the way to open up early communication that makes sense to kiddos!! I love how Leah is proving people wrong anout how smart she is.. My brother, and I were born with the cleft lip and palate,. We were judged as stupid, because of the scars on our faces, and how we spoke. We proved them wrong. My brother James had a genius IQ. All disabilities get labeled in one form or another. It’s a shame that people judge before they know the full story. Keep up the good work. It’s nice that Leah has family rooting her on in life. In 1968, when his parents found out my then three year old husband was hard of hearing, they were told the best case scenario would be for him to learn a trade. Learning a trade is a great thing if that’s what makes a person happy and is what they want to do but my inlaws wanted him to have more options. My husband never heard that story until it was told at a party when he got his PhD. My daughter is deaf blind with many other health issues and I have been battling the school system for 17 years. Our children ARE capable of learning their own way and in their own time! I even have to fight for her at the school she attends to this day and it is an ESE center school. Very sad and stressful and wearing on everyone. I am a teacher of the deaf in the public school system and wanted to tell you that I’m sorry for your frustrations and disappointing experience. I can’t imagine how frustrating that is for parents and I completely agree that you did the right thing. Kids should be pushed to their full potential and I don’t think they always are. I can tell you personally I want that success for all of my kids and that I teach grade-level material to my kids. I also want to say that having such supportive parents and starting school with such a large vocabulary is amazing! Great job advocating for her! I wish more people would do that! It is a sad situation that a deaf student is supposed to have done well if they graduate high school with a fourth grade reading level or less. I know that too many have little language when they start school so first must learn language before being able to learn to read as too many parents haven’t learned the importance of language, but the expectations are SD o low even if they have language that I was told r we heatedly thT I just would not accept my child had as disability, and I was a Special Ed teacher! I refused to accept this and Fortunately i Iwas as able to afford tutoring so he caught up with his typical peers and earned grades good enough to get into a college. He is now a teacher of deaf students trying to figure out how to get all his students caught up with peers, as his class was all several years behind. He is a first VB year teacher,but I hope his experiences and ambition will help him find a way for his students to succeed. It’s not only children that get underestimated. I had a speech therapist who was working with my mother after she had had a stroke tell me that “You can’t learn anything after 40.” This about a woman who had taught herself New Testament Greek at 75. We ignored her and my mother re-learned how to read, and even write a little. I LOVE this! We are a “signing family” with one deaf kiddo, and three hearing kiddos. There are a couple of things that I have observed both as an educator and parent. The statistic that “your deaf child will not read above a third or fourth grade level” is very skewed for a number of reasons. 1. I have no proof, but I think that stat has not been updated since the ’60’s (or so). And people, including educators are still believing it. I would be interested to know the level of reading for Deaf kids with Deaf parents, Deaf kids who have full access to language, and Deaf kids who have deafness only, without other special needs. I would guess that the stats would show a very different picture!